You know those conversations you dread walking into. The telltale signs are all too familiar: tummy flips, sweaty palms, the profound desire to feign illness and retreat to the comfort of your bed. My clients regularly describe similar symptoms before workplace negotiations and difficult conversations with colleagues (diff-cos for short). Consider the following real-life scenario a client found herself in – we’ll call her Stacy. Stacy had gotten a new job and needed to tell her current boss she was planning to leave. Whenever she brought it up, her boss was patronizing, like he thought it was a negotiation or didn’t believe that she really had an offer. She told me, “He kept treating me like I was his daughter asking for a pony, saying, ‘We’ll talk about this tomorrow.’” She didn’t want to have to keep putting off her new employer about a start date. Here’s what I would have recommended in that situation. 1. Decide to have the diff-co.
Realistically, Stacy couldn’t avoid the diff-co for long. She wasn’t going to stay in her job forever or just disappear one day, so she had to let her boss know that she was, in fact, leaving. 2. Strategize and practice with a trusted mentor, coach or friend. When emotions are running high – as they usually are in a diff-co – it can be difficult to get your words to come out right. When I’m in a situation where I can’t quite see a way out on my own, I rely on unbiased folks who know me well, can offer perspective and help me decide how to respond. While it can feel comically awkward at first, practicing with a trusted friend is among the best ways to determine what language feels comfortable. Based on Stacy’s description of her boss, this was a guy who readily dismissed her. Had we had a conversation, I might have suggested she schedule a time on his calendar and use her official resignation letter as a way to communicate her decisiveness, delivering it in-person in the meeting as well as via email. 3. Recognize the emotions that are coming up for you. Your emotions are an important – and often an undervalued – aspect of professional decision-making. Often, a client will come to me with what seems to them to be a straightforward career question or negotiation. As we begin talking, almost invariably the situation brings up significant emotions that impact the client’s experience and decision-making ability. It’s only once we’re present with those emotions that we can effectively move through them. 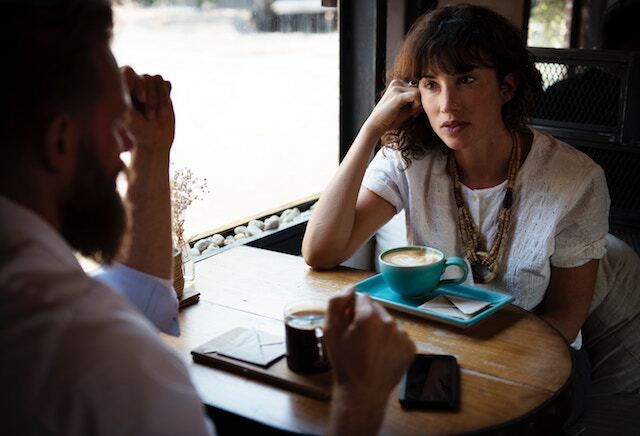 For Stacy, her frustration with the job overall may have been brought into even greater focus with these unproductive exchanges with her boss. She was likely feeling undervalued and disrespected. Her fears of further rejection from her boss may have also made it more difficult to initiate that diff-co. There are two things to note here: whatever emotions come up are valid, and they can affect your behavior and decision-making. Prior to a past diff-co of my own, my yoga instructor Mikhayla Anderson taught me this simple and lovely visualization in which you use colors as a force of protection and stability. I first used it when I was filled with dread about initiating a diff-co with a man who regularly made me uncomfortable with inappropriate comments and touch. By using this visualization immediately prior to the conversation, I felt greater confidence – grounded in myself and my perspective. As I used it in other situations, the visualization allowed me to be more at peace with the energy and effort required to change my situation. I’ve continued to use it as a tool with friends and clients who are struggling and would have encouraged Stacy to try it out. Ultimately, Stacy successfully initiated her diff-co and finally made it clear to her boss that she was leaving. It was likely a frustrating process for her, and while he made the resignation more uncomfortable, he had little choice but to accept her departure. When you find yourself in a situation that requires a diff-co, strive to strategize with a buddy, recognize your emotions, and use a visualization. This process can help you walk into these encounters feeling more centered and confident.